Today was a lovely day to spend harvesting for CSA – a cool clouded morning opened up into a nice breezy sunny 70 degree-ish day. 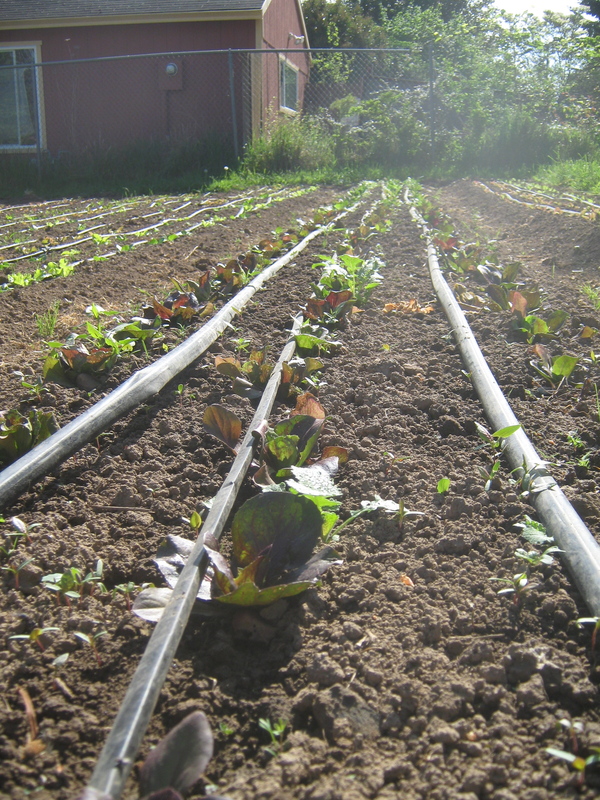 There are still quite a few large plantings to get in at the farm, namely winter squash, celeriac, and the outdoor peppers & eggplants. Unfortunately most of my winter squash seeds were eaten by rats before they germinated in my greenhouse (multiple re-seedings have mostly had the same fate, rat traps aside). Hopefully this week I will be able to beg and borrow or buy enough extra starts off other farmers with extras to make up for the loss. In the hoophouse at the farm the tomatoes and cucumbers are growing madly. I plan to get them strung up on some trellises tomorrow. My two worktrade volunteers, Michael and Laurel, have started helping with CSA harvest which is extremely helpful. Michael will be helping out additionally on other days as well which I am grateful for. – kohlrabi – with their leaves. 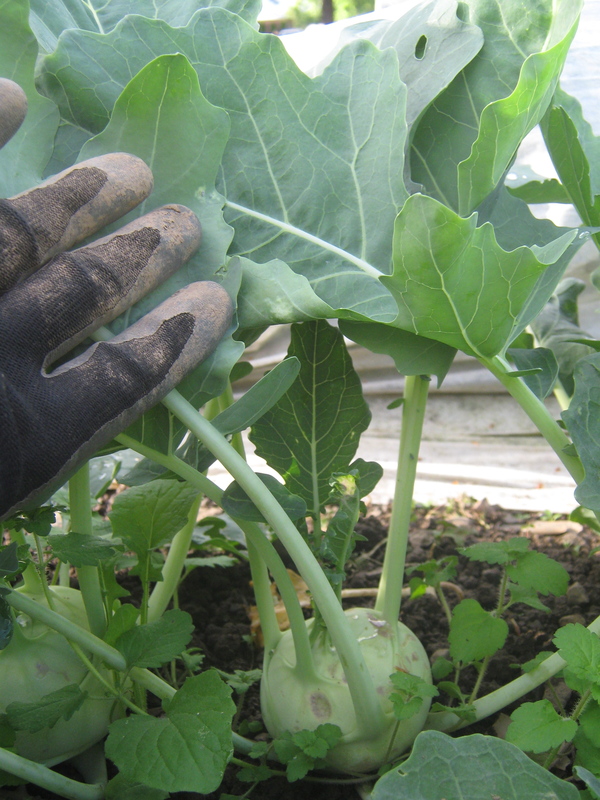 Kohlrabi is a swollen stem and can be peeled then eaten raw in salads or dipped into hummus or other sauces. Alternatively you can cook it various ways: cream of kohlrabi soup, roasted kohlrabi, kohlrabi fritters – endless possibilities! Also, the greens are cookable as well, though not as tender as kale. I made fritters tonight with grated kohlrabi, chopped kohlrabi leaves, turnips, green onion, mushrooms, eggs, flour, oil, grated ginger, salt, and pepper. They turned out delicious, especially with a little soy sauce and hot sauce. Sorry I don’t have a recipe – it was completely an off the cuff experiment. – snap peas – you can always stir fry these if you somehow get tired of eating them raw. – hakurei salad turnips – I’ve been sauteing the greens and then steaming eggs on top of them for breakfast. Of course the roots would be good chopped up in the lettuce for salad, along with any radishes you have leftover from last week.